I’ve been wanting to perfect a pattern for a simple, loose t-shirt. Similar to the one tie-dyed logwood t-shirt that I made in the summer, but a bit more refined. I found a couple metres of this purple jersey in one of my boxes of fabric. Score! I have a really fancy jersey fabric that I don’t want to mess up, so I’m happy that I tried this purple version as a prototype. 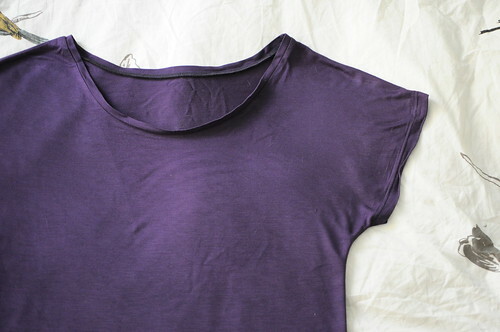 I’m going to make a few small changes to my pattern – drop the underarm to make the sleeve deeper and more ‘flow-y’ and make the neck less wide and slightly higher so that it doesn’t fall off my shoulders. I love the finished neck band. It is one of my favourite tricks from the T-Shirt class. Plus, since this is sewn on a serger, it comes together so quickly. I made the pattern, cut it out and serged it together in a few hours. I hemmed the sleeves and bottom using our coverstitch machine. So professional. If my next version turns out just right, I’m making a bunch! This tee + jeans = my fall uniform. I love your t-shirt! this is what I wear during the fall as well. Cotton t-shirts and denim…what a dream. That is pretty cool. I have never tried making clothes for myself. The closest I have ever come is hemming my pants! I love it! It’s very pretty. That looks so comfy. I love the length. so cute! i want a t just like this, i’ve got some beautiful rayon jersey i want to cut into, but i’ve been too nervous. i have a serger, but no coverstitch machine, what would you use to hem it? any tips for cutting knits? i would love to make my own tees, i love wearing them, but i’m so picky I don’t like them tight, with slightly longer sleeves, this would be a perfect way to finally get it right. on the list. Love it Karyn. Fantastic job. Really well done. James Perse better watch out! Awesome job! it looks so cute, and so comfortable!! Lookie Tookie what I found online…. That shirt is adorable! It would be totally cute with a belt too! I wish I had a shirt like that! What a cute t! You are as always, an inspiration… thanks for sharing!